Home→Fun Stuff→Attractions & Tours→Alabama→Crayolas aren’t just for kids! Aren’t Crayolas just for kids? I guess I always thought they were until the other day. 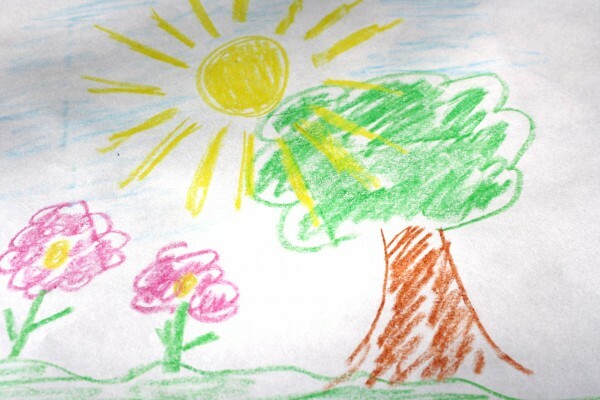 When was the the last time you picked up a Crayola and drew a picture (unless it was to help your kids or grandkids)? It’s been years for us – I think there were only 8 colors in a box of Crayolas when I was kid (oops, guess I’m dating myself with that comment!). 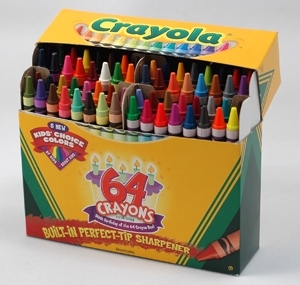 And even if you have created a recent Crayola drawing do you think you could sell it? Would you ever imagine that someone over the age of 12 could make a living using Crayola Crayons and brown paper bags to create “Crayolings” (yes, that is a “Lindaism” – I made up that word because somehow “paintings” just didn’t seem appropriate). Well, on Tuesday morning, we met an artist who does just that in the most unlikely place, the Crossroads Cafe! After another delicious home cooked breakfast, we were enjoying a conversation with Beth and Chris, the owners and our waitress, Konnie, when four guys walked in. When we were there before, Beth had pointed out the prints on her wall, explaining to us that they were all done with Crayola Crayons. That was so hard to believe – they actually looked like water color or oil paintings! It turned out that one of the four guys who had just walked in was Todd Alan, aka The Crayon Man. After introductions, he explained to us that he is one of four artists in the world who use Crayola crayons as their art medium. He has been drawing with Crayola’s on brown paper bags since he was a kid and had been trained by his neighbor, Don Marco, The Master Crayon Artist. He still uses the same grocery store bag brown paper for his canvas except now he buys the brown paper in rolls. Originally from Minnesota, he relocated here several years ago along with his wife (a photographer) and his dog, because he loves Alabama. They travel all over the country to get ideas for his art. Whatever artwork he creates, he tries to sell since he donates the proceeds to the Cancer Society and to various schools in support of their art programs. Some of his originals are on display at a local gallery here in Foley. 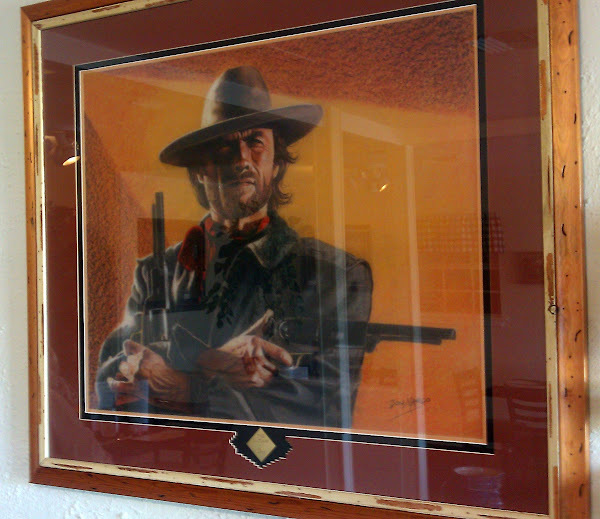 That afternoon, he was bringing in an original done by Don Marco – a one of a kind Josey Wales picture for Beth to hang on the wall. Beth was excited and nervous all at the same time – excited because it was one of a kind original and nervous because it was a one of a kind original, no prints have been made and valuable! Alan showed us a picture of the original on his phone – it was actually a picture of Clint Eastwood who played Josey in the movie “Outlaw”. It looked really incredible! We can’t wait to see the original! Update – today is Saturday, March 10th and we went back to Crossroads and we saw the original – wow, pretty neat! The detail was unbelievable – hard to imagine that anyone can create that level of detail with a crayon! The photo doesn’t do it justice – difficult to take a picture due to the reflections. Well, that’s it for now – have to go buy a box of Crayolas!